Flash floods can occur in nearly any area of the world. A rainfall-induced flash flood is a truly hydrometeorological event: one that depends on both hydrologic and meteorological conditions. Forecasting flash floods involves a detailed understanding of the local hydrologic features and continual monitoring of the current meteorological situation. This module examines both the hydrologic and meteorological processes that often contribute to the development of flash flooding. Common tools and technologies that are used in flash flood monitoring and forecasting, from manual gauging systems to complex radar- and satellite-based runoff models, are explored. This module also examines the strengths and limitations of these technologies, as well as how they are likely to advance in the future. thorough and clear discussion of the topic of Flash flooding. Provided useful links to information to be used as guidance in regards to estimating rainfall intensities via satellites. Interesting, Informative and interactive. I enjoyed this course! Was long but also very helpful! Flash Flood Processes are very useful for river forecasting. Flash Flood Processes of study a lot of knowledge. 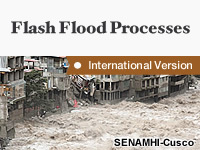 Flash flood process is very useful for all of country. Hi Greetings to all ! subject is very interesting.Especially sub heading Meterological infleunces is very informative.Thank you all. The Modules are too lengthy and it is taking lot of time, nearly 5 to 6 hrs in a day, to read thoroughly, thus effecting the office important works. So the Modules should be splitted into parts. This is a very useful learning tool and should be considered even when at home. This is a new topic for me. I could learn about flash flood process & it is more relevant in the present scenario of erratic rainfall and climate change. Very useful and the concepts explained in simple steps. I would be happy if you could provide a Flash flood guidance for small island countries in the Pacific Region. Overall, good. The flash flood tools and systems talks of some complicated stuff which can be made simpler and succinct.